Every restaurant strives to have loyal customers as they are the building blocks of a sustainable, profitable business. Capturing loyalty is the initial feat of making programs lucrative, but maintaining that loyalty can be rather difficult. Keep it Sweet, Direct, and Short – A major hindrance to signing up for loyalty programs is how long the pitch is or the amount of effort it takes to fill out the form. Briefly and simply introduce the customer to the loyalty program. No one wants to listen to a long speech when they’re trying to order their meal, so make sure to reach the point swiftly and illustrate how beneficial joining your restaurant’s loyalty program will be. It is a good idea to just get an email first and/or phone number because quickly jotting down an email is relatively easy. Another solid tactic is to ask customers if they would like to fill out the sign-up forms while they are waiting for their meals. Personalize the Program and Make It Fun – Creating a point system for items can generate positive buzz and making a game or competition out of it can also increase sign-ups amongst all ages. A free meal that the customer has earned will inherently taste better because customers feel that they have earned it! Personalized programs are a good way to see what precisely is drawing in customers, such as the ambiance of the restaurant because of live music or if the food is perfect. This is key data to improve all aspects of the restaurant’s operations. Look to the Future with Electronic Systems – Loyalty/rewards cards are often used, but many establishments are venturing into electronic cards to elevate the level of customer retention. The traditional method of stamping loyalty cards hardly generates any interest or buzz around it. Customers end up collecting piles of half-complete cards that usually do not benefit the customer. Apps and messaging programs like Belly, Spendgo, and OpenTable allow for customers to collect their rewards without keeping track of a flimsy card. These systems are simple to set up and will soon be the norm, so it is a fantastic idea to jump ahead of the trend. Loyalty programs are deeply engrained in successful business models. Customer retention can prove to be challenging in the face of endless competitors, which is why an emphasis on loyalty programs should be exponentially valued. 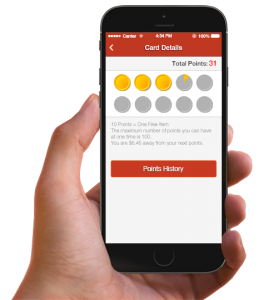 Loyalty programs are not limited to the restaurant business models. These ideas also go well with convenience stores, gas stations or deli stores. You name it. These are great ideas to keep your customers loyal. Previous post LinkRestaurant Terms: Glossary of Common WordsNext post LinkWhat is Indiana Grown? Troyer Foods is committed to being the preferred distributor of quality food, supplies, and equipment in the Midwest. We strive each and every day for superior customer service to ensure the trust and success of our customers, employees, vendors, and community.